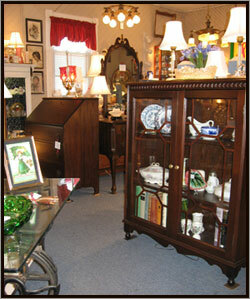 Established in 1990, Roaches in the Attic Antiques provides a large selection of quality antiques and collectibles. Located in the heart of historic downtown Herndon, owners Pam and Doug Roach take pride in the quality and affordability of items in their shop. 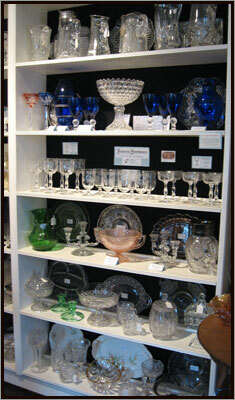 With beautiful displays of antique furniture, glassware, porcelain, period lamps and fixtures, the shop has quietly been the place for locals and tourists alike to purchase that one-of-a-kind gift for someone special or simply a great place to find the décor you’ve always wanted for your home or office. As long time lovers of Early American Pattern Glass, the Roaches have carefully curated a well-edited selection of merchandise second to none in the area. From the quality restoration of the furniture they sell to the authenticity of the antique glassware, Roaches in the Attic Antiques is truly what every antique shop should be. Located just minutes from Dulles International Airport in a turn-of-the-century town General Store, the shop boasts over 1500 square feet of merchandise from days long past. While the name Roaches in the Attic Antiques – inspired by Pam and Doug’s unique namesake – does not exactly conjure up thoughts of Victoriana and sparkling quality merchandise, general passers-by are delightfully surprised once they’ve made a small climb up a crooked set of stairs. 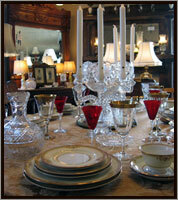 Pam and Doug invite you to discover one of Northern Virginia’s best kept secrets – Roaches in the Attic Antiques.